A friend told me last year that when Jupiter is in the night sky, you can see some of its moons with a good set of binoculars. Jupiter is back in our eastern sky just after sundown, so I tried shooting it with my little Nikon 510. Here is the result. 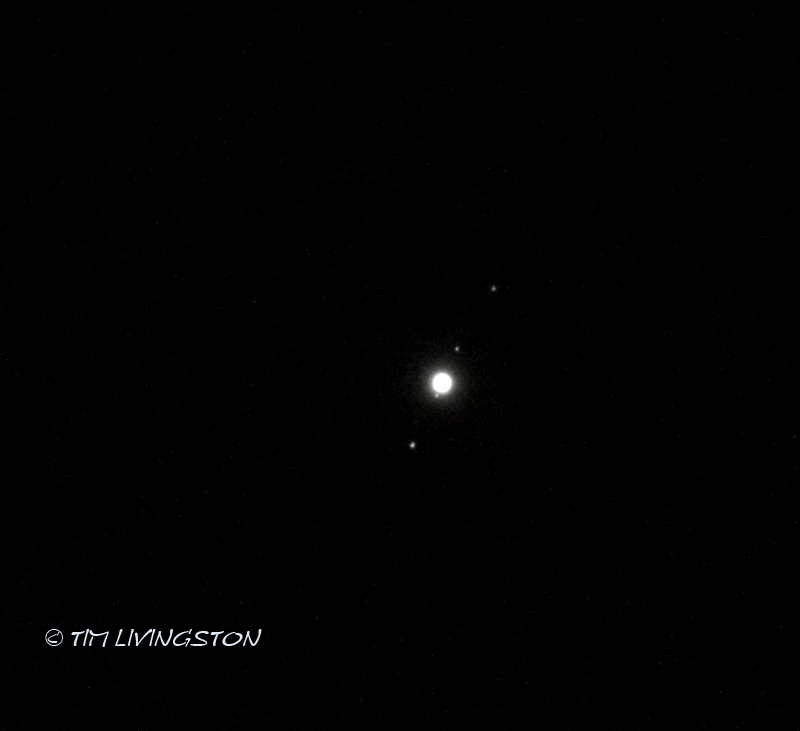 Jupiter’s major moons Europa, Io, Ganymede and Callisto are all visible in this shot. Don’t ask me which one is which. This entry was posted in Musings and tagged astronomy, Callisto, Europa, Forester Artist, Ganymede, Io, Jupiter, photography by foresterartist. Bookmark the permalink. Thank you Morgan and same to you. Great shot – and idea with your camera. Very nice and I learned something again. Thanks. Had no idea Jupiter would photograph with a “regular” camera. In fact I’d never seen its moons. It was new to me last year, but I had not tried a picture until now. I thought it was pretty cool! I forgot to ask Tim. What is the latest on your neighbour after the fire ? They’ve been cleaning up the place. There was a trailer that survived the fire with a little damage that they are staying in. How are you doing? Still flirting with those pretty doctors and nurses? That’s good news about your neighbours, at least they have somewhere to stay until the rebuild is complete. Glad to hear. It might be good to give the docs a break. Fantastic! Thank you so much for sharing this one. Black and white at its best. Very bright, but very tiny! It gives pause, like a good painting revealing itself. the moons, I have never seen these before, so with modern equipment you can capture them and with internet you can share them, and with a computer I get to see what you did, Thanks for sharing! They have been available for all of us to see. I just had no idea. There is just something remarkable about looking into the heavens and seeing a sight like this. Okay, won’t ask you which moon is which but … which of the three is Jupiter? The largest one surrounded by the two smaller ones, which I’m guessing are the moons? The large one is Jupiter and the tiny points of light are the moons. There are four of them there, but one is so close to Jupiter, on the left side, that it appears to almost touch it. I hope that answered what you were asking. It does. I thought the large one was Jupiter but just wanted to be sure. I didn’t even see the 4th point until you mentioned it! It’s kind of cool to see it and you should be able to from the Bay Area, unless the ambient light is too much. Yes, do so Mike. I think it’s so cool to see it for yourself. I hope you and yours have a Merry Christmas too. Amazing shot Tim, it’s great. I come to wish you and your family a very Happy Christmas. Tim hope you are not planning any trips up and away… we need you here to shoot the daily photos from the forest doubt they have any forest up their and if they do in your Nikon theor trees looks very tiny.. Have a Merry Christmas. Nope, not planning any long trips any time soon. I don’t expect to give the Hubble space telescope a run for its money either. Super, keep gazing and warn us before any aliens coming down for Christams dinner so we cook extra.. would not like to dissapointed them on such a long trip. Or we could cook them for dinner! How many you get for a kilo? they can stretch like spaghetti… love the idea send me your recipe…. ho dear there is a strange knock on my door..
Do you know how to cook octopus? Heat the oil in a heavy-based casserole over a high heat. When the oil is just smoking, add the garlic bulb halves, cut-sides down, and the onions, and fry for 2-3 minutes, or until the onions are crisp and golden-brown. Add the octopus pieces and stir fry for 30 seconds, then reduce the heat to its lowest setting. Squeeze over the lemon juice and sprinkle over the bay leaves, thyme and peppercorns, then cover the pan with a lid and continue to cook for a further two minutes, or until the octopus pieces have released their purple-pink juices. Continue to simmer the mixture over a low heat for 1 hour and 45 minutes to 2 hours, or until the octopus is tender and offers no resistance when pierced with the point of a knife. When the octopus has stewed and is tender, add the peas and continue to cook, uncovered, for 8-10 minutes, or until the volume of cooking juices has reduced and the peas are tender. Season, to taste, with salt and freshly ground black pepper. Whisk in the cold butter (or olive oil) until well combined, then sprinkle over the chopped wild fennel fronds, if using. Serve immediately. Delicious, just substitute “alien” for “octopus.” We’re coming to your house for dinner! I just laid the table as it will be a super suprise and great pleasure to sit with you all together for our joint ‘Alien Feast’…. could not wish to spend my Christmas dinner better.. I will be in England this evening and not in my normal weekday mansion at Mars, the driver will pick you up at the airport. Right “O,” we’ll be there with bells on! 🙂 The house is always open for you my friend Hope you all have a Happy New Year. I am honored by your friendship Doron. Perhaps someday our paths will cross in person. Hope it will it will be great pleasure…. you know what I am going to work on this lotto ticket love to see you all earlier. It’s go to take a lotto ticket to do it. In my lazy state I’ll do it online.. if you don’t hear from me you know I won if you do…. very sad… I did not. have a good weekend. Lotto ticket online! The goverment will drain you all dry if it’s that easy. The sneaky devils…. Dammit did not think about it and just gave them a life line to my account.. never thought about it..
You hear that big sucking sound…..I think it may be your account! Wow – very cool! Have a bountiful New Year! Thank you Susan, we had a wonderful Christmas and I hope you and your family did as well. May your New Year be ever so bountiful! Wow, I would just had thought the moon’s were stars. Happy holidays (almost over) to you and your family. Thank you Ruth. I hope you have a fantastic 2014. How on earth 😉 did I miss this one …. Very nice capture of moons !